It’s finally December and that means that the Holidays will be here any minute! Don’t worry; take a deep breath because we’ve created a Holiday Gift Guide to give you some shopping inspiration. Keep reading to see what we have in store! 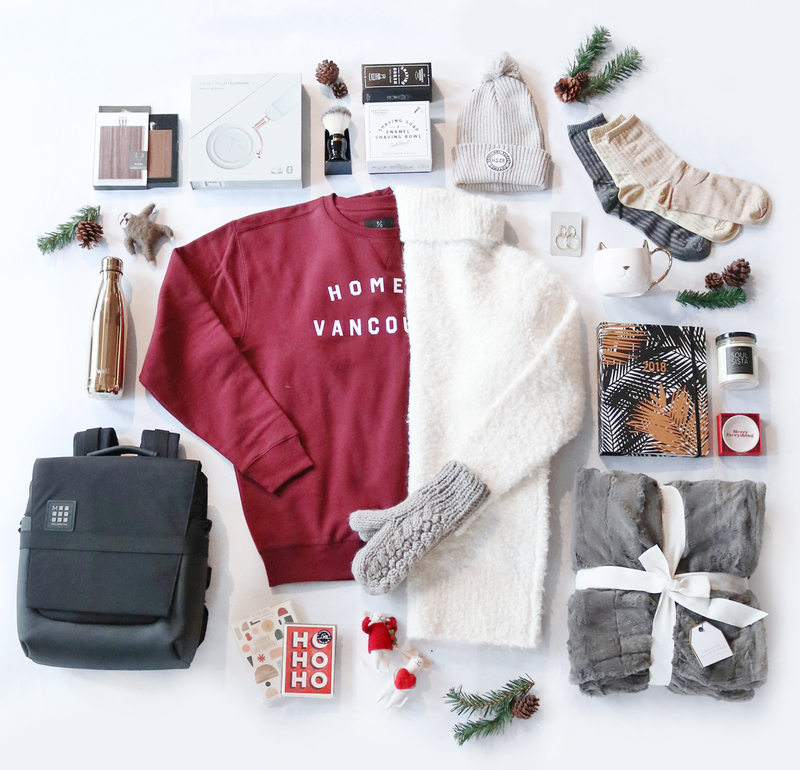 Any Vancouverite would be proud to sport this cozy crew. Available in red or black, this is also a great idea for someone who is new to the city. We all know somebody who takes their facial hair very seriously. Treat them to a pampered shaving experience with this synthetic shaving brush and sandalwood shaving soap. These wireless, noise-reducing headphones have both style and substance. The great sound as well as the sleek, minimalist design is sure to put a smile on any music lover’s face. We think that this little sloth would be a great guy to hang around with and a great stocking stuffer for all animal lovers. These stainless steel water bottles come in so many colours and patterns that you can find the perfect one for every person on your list. Even if you aren’t able to see all of your loved ones over the holidays, send them some good cheer with a thoughtfully written card. For that person always on the go, this compact backpack has plenty of compartments for all their essentials while the clean design keeps them looking smart. Cheers to your vintage loving friends. This stainless steel flask holds 2.5oz and features a real wood panel, giving it a polished mid-century design. Warm hands are happy hands. These thick, cable knit mittens are sure to keep even the coldest hands nice and toasty. Cute doesn’t even begin to describe these little mice. They come in so many different outfits from corduroy overalls to glittering tutus; it can be hard to pick just one. For all those home décor lovers in your life, this blanket is incredibly soft and adds that little touch of luxury to anyone’s living space. Help someone get organized for the New Year with this stylish planner. It allows you to plan your entire month, as well as break it down to day to day tasks. A perfect stocking stuffer for that someone who loves the holidays so much they would probably really say “Merry Everything”. This range of candles has a variety of cheeky phrases on them, making them a great gift for your sassy BFF. And dang, they smell amazing too! Your cat-loving friends are sure to love this giant mug. Available in black, white and grey, these mugs have a sneaky phrase written inside them that’s revealed when your drink is finished. Give the gift of glitter with this set of sparkle socks. Available in a selection of fun colours but all are equally sparkly. These delicate double hoop earrings are 18k gold-plated on sterling silver posts, making them a great gift for those with sensitive earlobes. Top it all off with a cozy toque. Perfect for these colder months and, honestly, who doesn’t love a good toque?